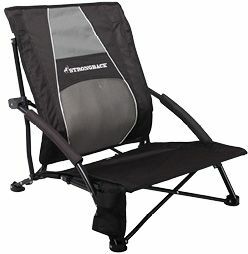 The first-ever reclining camp chair is so comfortable you might want it in your living room. 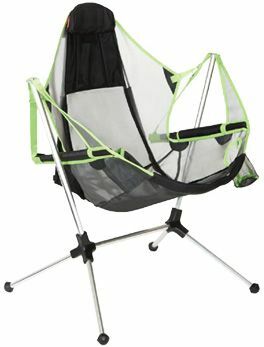 “More like a mini-hammock than a chair,” it has a free-swinging seat and a headrest that prevents neck strain while stargazing. 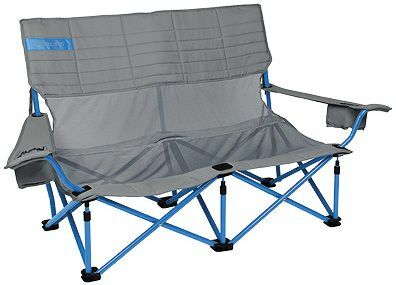 With its cushioned lumbar support and padded armrests, this sturdy low-slung chair is ideal for the beach, a boat deck, or outdoor concerts. It packs into a small bag with shoulder straps for hands-free carrying. 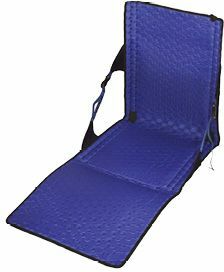 “Sitting around the campfire should be romantic,” which is why every camping couple needs a portable love seat. Kelty’s has a cup holder on each arm and a mesh back to let in a cooling breeze. It’s great for families with kids, too. Sometimes you need only a better way to sit on the ground, and a seat light enough to take anywhere. 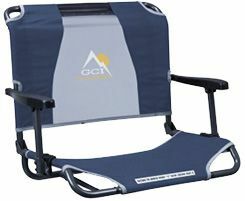 Ideal for backpackers, the 30-ounce PowerLounger packs into a compact roll, supports up to 250 pounds, and can double as a sleeping pad. GCI’s lightweight foldable seat clamps to a picnic table bench or stadium bleacher to provide comfort and back support where both are in scarce supply. A similar chair without arms is also available.